They have arrived! In all colors shapes and sizes. 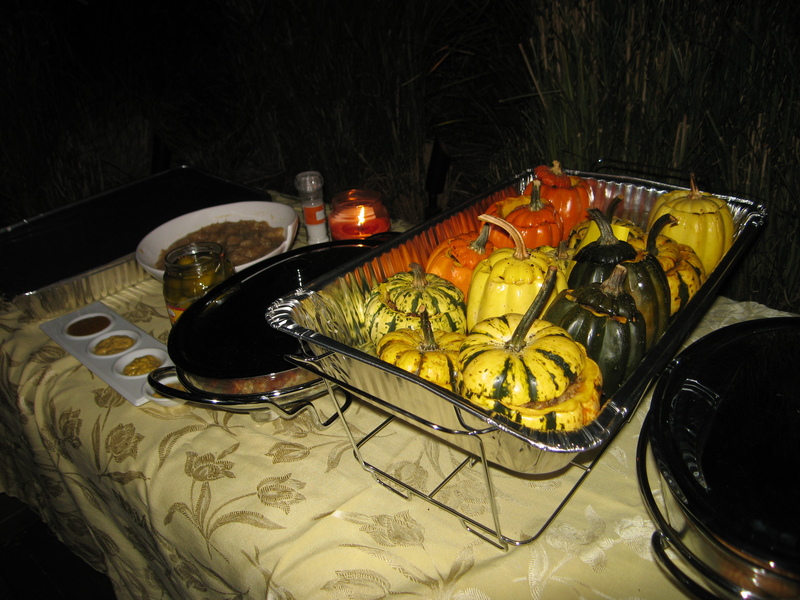 Ladies and gentlemen, may I present – The Winter Squash! There are so many things I love about this time of year. The brisk mornings, the beautiful changing of the leaves, and most of all the hearty rich flavors of the season, particularly squash. Winter squash (as opposed to your summer squash, such as zucchini) have thick tough outsides with sweet, rich flesh on the inside. The outer skin should be undamaged, and dull in color, which means it was picked when fully mature. When selecting a squash it should feel heavy and solid. Also, make sure the stem is still attached, as a detached stem means it has been on the shelf for too long. Do not refrigerate unless they’ve been cut. 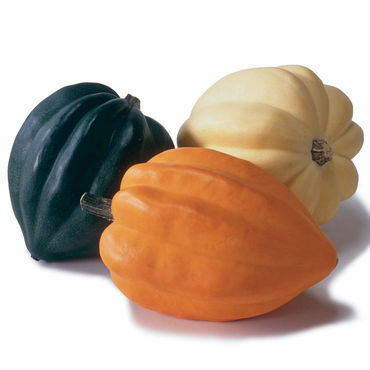 The smaller squash should be used within two or three weeks of purchase while the larger varieties can go for as long as six or seven months if kept in a cool, dry place out of the sun. People joke about needing a small chain saw to hack into these guys, but a good kitchen knife and some muscle should do it. I’ve even heard of microwaving for a few minutes to soften them up. Or start them baking in the oven, remove, cut, then continue cooking. Either way, be VERY careful. Another delight when working with squash is that they are pretty versatile in how they can be prepared. The most popular techniques are baking, roasting, pureeing and stuffing. My two favorites happen to be roasting and stuffing. Roasting requires cutting the squash into bite-sized pieces, seasoning with some olive oil (and maybe some thyme and garlic), then placing in a 350°- 400° oven until a nice golden color appears with crisp edges. Stuffing requires a little more preparation but makes for a beautiful and creative presentation. 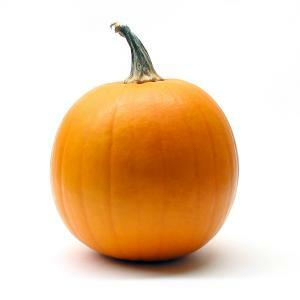 Pumpkin – mostly decorative but can be baked, roasted or pureed. It provides more beta-carotene per serving than any other fruit or vegetable. The smaller sugar pumpkins are very popular in baking. Also the beloved seeds can be roasted with a little olive oil and salt. The seeds are also popular in Mexican cuisine with cumin, coriander and jalapenos. The yellow- to cream-colored flesh comes out in strands when cooked, giving the squash its name. Year two of my Oktoberfest celebration was a great success! Each time I host one of these parties I feel like I learn more about the need for organization, timing and in this case food warmers! Great experience for me as a budding culinary (insert culinary profession here). Again, big thanks to my little sous chefs! And we topped it off with some great German Beer and Spiked Cider! 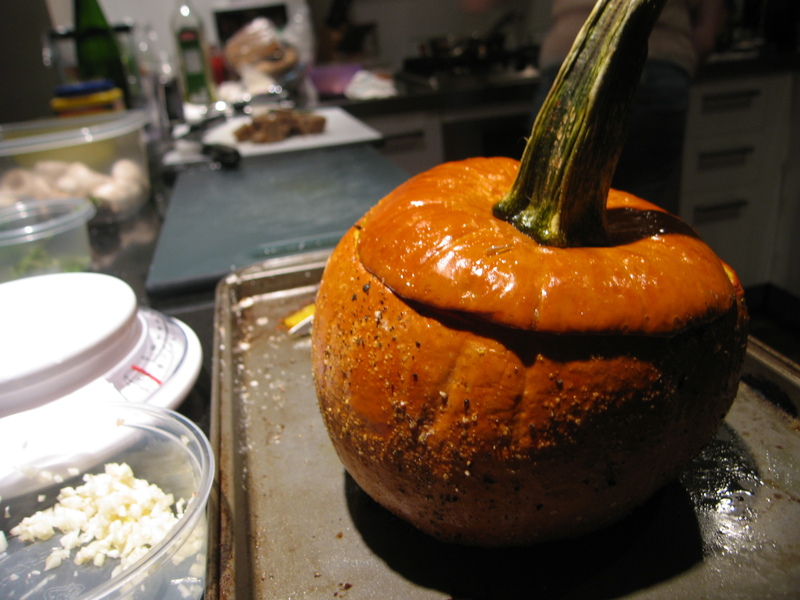 Prepare a small pumpkin (sugar pumpkin is fine) by hollowing it out and massage inside and out with a little bit of olive oil, throw in a few thyme springs, sea salt and pepper. Make sure it can properly stand up-right and roast along with the lid, in a 350 degree oven until golden (about 40-50 minutes). While pumpkin is roasting, mix the potato flour (or cornstarch) with 2-3 Tbs of wine and set aside. Put the remaining wine in a medium-sized, heavy based sauce pan over medium heat and bring to a boil. Simmer for another 2-3 minutes and then add the garlic and bay leaf and reduce heat. Add the Gruyere and constantly stir to melt. Remove and discard garlic and bay leaf and stir in potato flour mixture along with Kirsch (if using) until smooth. Add Taleggio or Fontina and stir until melted and finally add the cream. Season to taste, and stir over heat until you see a nice velvety texture. To serve, pour mixture in pumpkin, place the lid on top. I would recommend a nice dense grainy bread for dipping.